Girls Weights Prog/Bar Crusher Powerlifting Club! Sowilo was established by a group of parents who wanted their teenage children to study in an education system that embodied a holistic approach. Dr Adrienne Huber a psychologist and educator working with Edith Cowan University at the time was one of these concerned parents. Others who shared the educational philosophy joined this group of committed parents and under the guidance of Dr Huber began facilitating classes. These initial classes began in term four of the WA school year and were held at the Karrakatta Community Hall with only five students. Six weeks after classes commenced Dr Huber left for Adeliade to take up a university position. While the school operated without registration it was not eligible for any government funding and to keep the school operational the founding parents financed the school. In keeping with the student centered philosophy of the school, students were asked to name the school and Siobhan Lebel, a keen enthusiast of ancient languages suggested the Nordic word for sun, sowilo could be appropriate. On investigation it was discovered that the word sowilo in the runic alphabet also means illumination, wisdom and knowledge. The students unanimously voted for Sowilo to be the name of their school. By the end of term four 2000, the school had to find new premises and it moved to Wembley in January 2001. Sowilo Community High School began the academic year in term one 2001 with five students, three part time mentors - academic mentors and one youth worker. 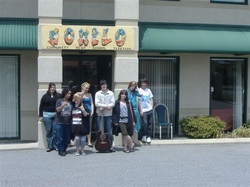 The school council applied for its certificate of Incorporation and in April 2001 the organisation was incorporated as Sowilo Community Inc. By the end of term one, the student numbers had increased to ten full time students and staff increased to four permanent part time mentors, one administrator, one youth worker and two academic mentors including the coordinator. Throughout term one Sowilo Community High School operated without registration and was still being completely financed by the students' parents. In June 2001 Sowilo Community High School received its registration as a school with the Ministry of Education and became eligible for funding through recurring government grants for schools - federal and state. During the second half of 2001 student enrolments doubled to twenty full time students and Sowilo council employed two more part time staff. It became apparent to the school’s staff, that the majority of the students enrolled at the school were disaffected young people in need of psychological and emotional support. In light of this, the youth work component of the school became important in assisting these young people with their daily attendance. Students who weren't ready to enter the classroom worked with the youth worker and the youth worker liaised with the schools' mentors, family and appropriate agencies on behalf of the young person. Youth agencies both government and non-­government made student referrals to the school which increased the student numbers to twenty-five towards the end of 2001. In fourth term 2001 the owner of the building rented by the school, informed the school's council that he would not renew their lease because he was selling the property. The school had to move again and the coordinator at the time, Mr Ross McCullum liaised with the State Education Department and secured the schools premises - the old Swanbourne Primary School. At the beginning of term one 2002 the student numbers dropped by half and funding was cut. During this time the school also experienced a turn over in staff, which included its Coordinator. This was a difficult time for Sowilo Community High School as it struggled to keep its doors open and provided for the remaining students. In May 2002 Sowilo Community Inc council applied for Schools Transitory Emergency Assistance grant (STEA). The school's newly employed coordinator Ms Sharon Ford along with staff and members of the school's council worked persistently to keep the school operational. Staff worked long hours and agreed to work for no pay in the hope that the STEA application would be successful. The school was strongly supported in its STEA application by Mercy Reconnect and other youth agencies. Politicians such as Julie Bishop MP federal member for Curtin and Carmen Lawrence also supported the STEA application. In August 2002 Sowilo Community High School received its first STEA grant payment and the second payment was made in November of that year. Ms Ford resigned due to family reasons and in term three 2002 Ms Geraldine Maddrell (the then Chairperson of Sowilo Council) was employed as the school's coordinator. Ms Maddrell's calm, supportive and collaborative leadership brought stability to the school community and consolidated the management team. In 2005 the school had to once more relocate! The Swanbourne Primary School premises were to be sold and developed. In consultation with the Canning District Education office, Sowilo decided to move to this district that was in need of an alternative education facility to cater for a number of non attending students. The move to this district has been beneficial both to the school and the surrounding communities. The student enrolments have been steady at 40 (the current building capacity) with a waiting list at times. 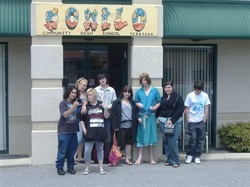 Sowilo continues to consolidate it unique service to young people in the South East corridor of Perth and looks forward to one day providing the stability to the school community of owning its own building. Sowilo has now secured a low interest loan to enable us to purchase our very own building! We are currently awaiting council approval on a potential new site. Until then, we are temporarily operating from Wilson Hall in Wilson (see our contact details) and eagerly await a time where we can have a permanent address. We are now operating from our new building located at Unit 1 / 2 Gillam Drive in KELMSCOTT !!! After such a long process, we are all very excited to have a new location. Sowilo is pleased to announce that they now own their very own premises located at Unit 1 / 2 Gillam Drive in Kelmscott !! It is so fantastic to know that Sowilo will always have a permanent home in the community.